Dubai has become a monumental melting pot of cultures in the past decade. It has grown from a barren desert into one of the world's most scenic cosmopolitan cities amassing an impressive population of 2.8 million residents. It is known for its luxury shopping and a thriving nightlife. Dubai is also fast becoming synonymous with modern architecture, widely popular for boasting the world's tallest building, Burj Khalifa, and the majestic sail-shaped Burj Al Arab that is routinely voted the world's most luxurious hotel. Apart from all the much-hyped about tourist hotspots, Dubai also comprises some discreet yet alluring sites that should be an integral part of your next trip to one of the most popular tourist destinations in the world. The Walk, a 2-mile long walkway along the beach, is one of the few buzzing outdoor tourist attractions in Dubai. It offers a wide variety of retail therapy options from designer brands to stalls of jewellery and handicrafts, alfresco dining and regular encounters with street entertainers. It is also a perfect spot for a leisurely stroll along the waterfront where a light breeze from the Arabian Gulf makes the experience more pleasurable. The Walk is most frequented by visitors after dusk as daytime temperatures can be scorching. Another highlight of the Walk is the open-air cinema that operates one week a year where you enjoy the best of the movies under a starry sky. For details about this year's film fest and other attractions on The Walk. The name speaks for itself. Every year, the Emiratis out-do themselves and transform a wide area, in the middle of the desert, into a picturesque display of over 45 million flowers of about 60 different species. Apart from an awe-inspiring display of flowers, some of them grown in the gulf region for the first time, the gardens also host different monuments adorned with flowers such as a huge clock, a replica of Burj Khalifa, tunnels etc. However, due to blistering summers, the Miracle Garden only opens its doors during the winters for an astounding number of up to 1 million visitors every year. Keeping water conservation in mind, the flowers are irrigated by reusing waste water through drip irrigation method. AED 30. Entry is free for disabled people and children under the age of 3. Based on the theme ?Return of the Pharoah?, the show enthrals its audience with a spectacular combination of captivating visuals and synchronized music. The lights are projected on the Pyramids and other Egyptian-inspired architecture that forms the defining part of the Wafi Mall. The show takes place at the Khan Murjan Souk entrance of the mall every day at 21:30 except for a brief interval every year. The attraction is absolutely free for the public. Ever challenged your friends in a Kart Race? You could do it at the Emirates Kart Zone and beat them in the game like a mini Grand Prix of your own. Or you could just have a fun round enjoying the feeling of letting yourself go on some cute little karts. The Emirates Kart Zone Is located in the Al Wasl Sports Club and just a 7-minute drive away from Dubai Mall. The Gold Souk consists of a network of covered alleyways that are lined with numerous jewellery shops selling gold, silver, diamond and other precious gems. A visit to the Gold Souk is an experience in itself even if one does not want to make a purchase, as the window displays of the shops make for a striking exhibit. Due to strict government laws, the goods are authentic but you will have to haggle for the best price as souk vendors are notorious for quoting high prices! In a city full of extravagant malls, Dragon Mart has carved its niche for housing the largest number of Chinese traders under one roof outside of mainland China. Stocking everything from furniture to machinery to decoration, the structure is built like a mighty dragon and boasts over 4000 stores. The mall opened in 2004 and plans for further expansion have been recently launched. The expanded area will include a cinema, a hotel and various new shops and kiosks. Dragon Mart is a paradise for bargain hunters and it is safe to say that this is one mall in Dubai that won't leave you with a depleted bank account at the end of the visit! Nestled in the city of modern architecture, Al Bastakiya is an ode to historic Iranian architecture. It is the oldest residential area in Dubai built at the close of the 19th century by Persian merchant traders from Bastak, Iran, hence earning the name Al Bastakiya. Situated along the Dubai creek, the area was restored imaginatively into a heritage site for tourist attraction. The neighbourhood is reminiscent of Dubai's history showcasing houses consisting of intricate decorative grilles, wooden lattices, and traditional wind towers; an ancient yet effective form of air-conditioning. The labyrinths of narrow lanes are occupied by a museum, art galleries, quaint courtyard cafes, and boutique hotels. Mercato is a modestly sized shopping mall, covering an area of 643,067 square feet, situated in the heart of Jumeirah. But what sets it apart is its architectural brilliance that is inspired by the Italian Renaissance. 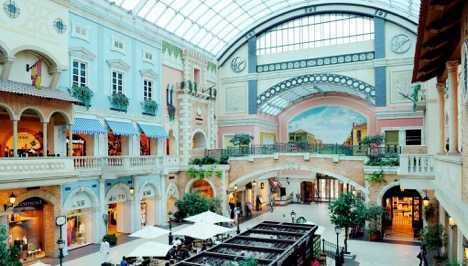 A walk through the mall transports you to the streets of old Italy with cobbled streets, picturesque balconies and even a bridge that offers a sweeping view of the mall. The mall has over 140 shops including international brands and service outlets and is open for public everyday from 10:00 to 22:00. On a tour, you do!